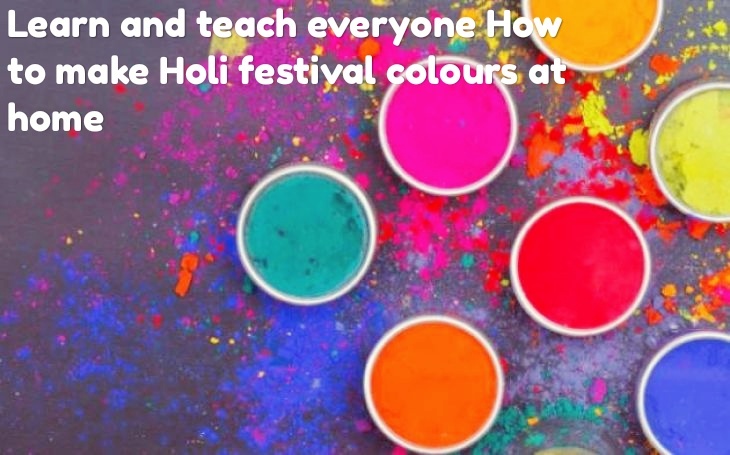 Learn and teach everyone How to make Holi festival colours at home. How to make red colour. Without color red color, Holi seems to be a bit faint, to make a dry red color, this color can be made by mixing it with a powder of red coconut flour. For this color, the paste of tissue and the paste can also be used as a paste. If you want to reddish the red color, add turmeric in a little water and squeeze the lemon into it. In just a few seconds you will get a bright red color. Such colors will not harm your body in any way. How to make yellow colour. To make yellow color, add two spoonful of turmeric powder, add two gram flour. Your yellow color is ready. Turmeric and gram is very beneficial for the skin. You can use the powder made by grinding turmeric and lime dry flowers as yellow as well. Apart from this, you can also use turmeric, flour, flour, rot powder, multani clay and oil with telkum powder. With this color you will not be afraid of allergies and turmeric will also protect your face. To make orange color, boil 12 large bowls in half a liter of water and peel them. You will see the water has become orange. Apart from this, keeping the flowers of Tesu soaked in water throughout the night will become yellow-orange color. You can soak the saffron in water for a few hours and grind it and after that add water to it, it can also make wet paint. How to make green colour. It is easy to create green colors at home in the color of the most used colors in Holi. To make this color the leaves of dry green color will be required. Spinach, Coriander, Mint, grind some of the same green leaves and mix a little dough; green color will be ready. If you want wet green color then grind spinach and coriander. How to make blue colour. To make the blue color you will need to grind the flowers of blue coconut dry. This will get dry blue color. This flower is very rich in Kerala. If you have to paint somebody's face then grind the agar and mix some water in its paste. This will give you black color Do not use chemical color for this. 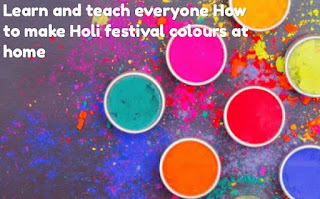 Learn how to make Holi festival.